Both pairs of membranous wings similar, though the rear pair may be slightly larger. Nymphs aquatic with 2 slender tails. 3000 species worldwide, 400 in Europe, 41 in Britain. Most species occur in cool and temperate areas. Adults range in length from 6 - 64 mm. Nearly all species require unpolluted fast flowing water, and so are often used as an indicator of good water quality. May share a common ancestor with the Embioptera. The stone files are thought to have first appeared in the Permian. Adults are rarely noticed as they are relatively inactive, reluctant fliers, and blend into the background. They are largely nocturnal. They live for just 2 or 3 weeks, and they spend most of this time crawling around on stream side stones or nearby vegetation. Many do not feed as adults, but those that do eat algae or pollen. They tend to fly only when disturbed. The hind wings tend to be slightly broader than the fore wings, and the wings beat out of sync. Some males may be wingless, or have short, non-functional wings. 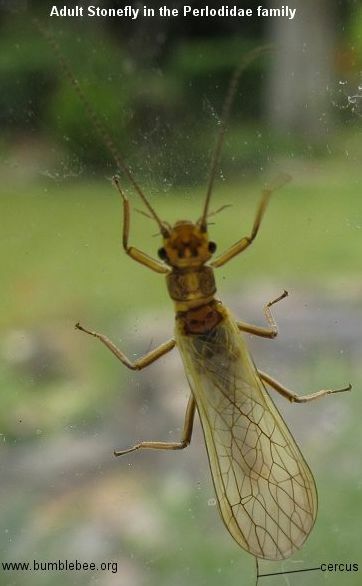 An adult stonefly can be recognised by the "double ladder" down its wings, this can be seen in the photograph above and below. This is formed by 3 almost parallel veins with a large number of cross-veins. The cerci may be long and filamentous. The antennae can have up to 80 segments. Their compound eyes give them good vision, and they also have 3 ocelli. The male signals his desire to mate to the female by beating the ground with the tip of his abdomen. The pattern of beats is different for each species. If the female is receptive she replies with a series of taps on the ground with her abdomen. The pattern of taps is different in males and females, and between different species. Mating usually happens on the ground or on vegetation. The female then flies over the water dipping her abdomen in to wash off the eggs, or she swims on the surface while laying eggs. Each female can lay hundreds of eggs. The eggs have a gelatinous coating that swells up and absorbs moisture. This enables some eggs to survive in streams that dry up periodically. In the U. K. most species have one generation per year. The eggs stage lasts about a month. Cold can halt the development of the nymph, and then a generation may take more than one year to complete. Nymphs are usually found on stones on stream beds, and are an important food item in the diets of many fish caught by fly fishermen. They are poor swimmers though. They look similar to the adult (see below), but are wingless. They get most of their oxygen by diffusion over the body surface, but some species also have gills. They are mainly vegetarian, eating moss and algae, and detritus but some larger nymphs will eat the nymphs and larvae of other aquatic insects. Development from egg to adult can take 1 - 3 years, and during this time the nymph can moult as many as 33 times. In winter the nymphs hide in the mud.